Matthew is a Senior Lecturer in Film Practice in the Division of Film and Media, School of Arts and Creative Industries. 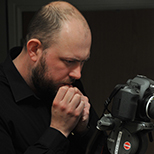 He specialises in film practice as research with an interest in affect and tone in narrative cinema, documentary film, and experimental practice. His films are regularly screened nationally and internationally at film festivals and academic conferences. He is the recipient of both the European (Milan, Italy) and the North American (San Francisco, USA) jury prizes for documentary practice from the Association for Consumer Research. Matthew’s film practice has received funding from the National Lottery and Channel 4, The Arts and Humanities Research Council, The Leverhulme Trust, Team London GLA (Mayor of London), and The Capital Foundation Trust: Grassroots Fund. His PhD, entitled The Concept of Affective Tonality and the Role of the Senses in Producing a Cinematic Narrative, is focused on the concept of affective tonality, and how this can be used as a tool for understanding the experience of cinema, and how film theory can emerge through film practice, drawing theoretically on the empiricism of Gilles Deleuze, and the wider field of film-philosophy. Matthew’s is currently researching the ontology of film practice, experimental approaches to documentary practice, and visual methodologies.